The Seventh Sabbat of the Wheel is Lughnasadh. Lughnasadh is celebrated on August 1, and is the festival celebrating the Celtic God Lugh, a solar deity. It is also considered the first, or grain, harvest. This Sabbat celebrates the harvesting of the grain, and it is through this harvest that the God is sacrificed to give life to the people. When the scythe cuts down the wheat and corn, it cuts down the God. 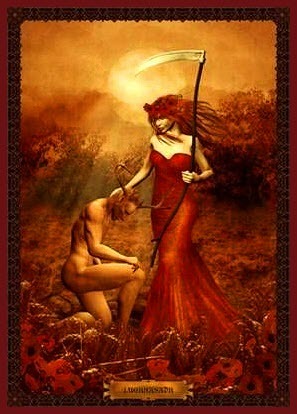 The Crone wields the scythe, and She is often depicted as Cerridwen, the Celtic Sow Goddess. During this Sabbat we concentrate on harvesting what we planted during Ostara. We focus on the culmination of projects started earlier during the year. This meditation is appropriate for use during the harvest festival of Lugh. I recommend a dinner of corn or grain products following the meditation. It is also a good time to review the progress you are making on various projects you currently have going. Take three deep breaths and close your eyes. Our ancestors relied on the harvest to ensure their survival in the coming months of darkness. Today, we rely on supermarkets. But remember, the food still comes from the Earth and if She falters, so do we. The Wheel must still be turned, and that is why we are here tonight, to help the Earth Mother and Her Consort move the season, for on Lughnasadh the King of the Corn must fall so we might live, and the Goddess will take Him into Her underworld realm as She begins Her transformation into Crone. You are in a protected space, and it is the eve of Lughnasadh, the first harvest, the harvest of the grain and vine. It is a warm twilight night during the late summer. Midsummer’s Eve has passed some time back and the days begin to feel shorter. The sun slips below the horizon a little earlier every night and even though the days are warm, there is a tinge of coolness to the breeze. The slightest hint of impending autumn comes creeping into the early morning when you wake and crack open the window. You are standing at the edge of the corn field, now barren and harvested. The corn dollies have been made for tomorrow, the last wheat sheaves have been fashioned into guardians against hunger for the coming year, the seed has been saved for next spring’s sowing. There is a tang in the air, a certain crispness that will not fully manifest until the second harvest, the autumnal equinox, but the first hints are present in the breeze. It is a night for vision-quest, a night to focus on what you are personally harvesting into your life and what you are sacrificing, what you choose to let go of so that other qualities may flourish. You have with you a small bag containing all the tools you need this night, and so you step away from the cornfield, onto a path and head towards the woods that lie directly in front of you. The path is dry from the heat, and your bare feet are warm as they kick up the dust. It has not rained for a long time. The silhouette of the forest stands steady against the darkening sky and as you enter the woods, you can feel the sap running thick in the trees around you. They are already preparing for the long winter’s sleep to come. You hear small animals rustling in the brush around you, but this night is not for running off to play with the wild and you leave them to their hunt and continue along the path. Soon, the path begins to slope gently upward. The grade is not difficult though you are walking at a slower pace, and as the night waxes you find the air a bit chill, so you pull your cloak a little tighter around your shoulders. Now, with the moon full over you, you see what you’ve been looking for. There is a path splintering off to the side, off to your left, marked by a trellis on which grows the sacred vine. Full, ripe grapes, dripping with purple juice, have been left hanging here, for this is the entrance to the Arbor of the Gods. There is a sacred well made of agate guarding the left side of a pergola. It is dedicated to the Goddess, and you kneel before it in reverence before turning the crank to draw up a bucket of crystalline water. Use the silver ladle that hangs from the well to dip into the water. Drink and then anoint yourself with the pure, clear liquid. Now remove your shoes and leave them at the entrance. You are ready to enter the Arbor of the Gods. The archway hangs over the path, which is no longer dusty with soil, but now a trail of flat stones set within a grassy bed. They are smooth and do not hurt your feet. Follow the path as it winds through a wide swath cut through the forest. All around, you can hear the low drone of late-returning bees as they make their way back to the sacred honey hives lining the farthest edges of the path. The moon is high overhead, past its zenith and as you look up into the clear sky, you see an owl glide by, silent in its hunting. Now you are nearing your destination – a large circular meadow surrounded by a ring of standing stones. A wide, flat stone is centered in the middle of the circle and around the granite monoliths twist thick sturdy grape vines. They seem to move as you watch, writhing, showing only hints of the granite below. Most of the grapes have been picked now, but here and there a thick cluster peeks out from below the shiny leaves. Set down your backpack and rest on the cool grass. As you relax, open the satchel and lay out what you’ve brought. First, there is a bronze sickle, with a handle carved out of antler. Next to that you place an ear of corn, still in its husk. Then, a candle and a box of matches. A small bowl of barley follows, and a scattering of oats. A bottle of mead rests on the ground now and a piece of felt with cord to bind it. Lastly, you bring forth a piece of paper and a pencil. You are set for the night’s working. After you have rested, rise, and with the sickle approach the sacred vines. There, close your eyes and commune with the spirit of the Grape, asking if you may take a cluster for your rites. If given permission, raise your sickle and cut the vine, removing one cluster, not harming the rest. This will be your food for the night. If you were refused, then you know the God has decided you will not need the extra nourishment. Next, lay out the felt on the central altar stone and place a pinch of the barley and oats in its center. The rest of the grains you may scatter around the alter stone in offering. Now, sit still and let the waning night carry your spirit towards the dawn. As you sit, first think of the harvest, and of what you personally want to harvest during this season. What projects have you started that you want to complete? What tasks have you been putting off that you must catch up with? What personal goals have you shoved aside in the hurry of everyday life? Let the energy of the harvest bring those thoughts to bear. As they become clear, pour the energy into the felt pouch and tie it up, tightly, charging the grains within. Know that now you will be able to harvest these dreams and goals and hopes and manifest them into reality. Lay the pouch on the altar stone and set the candle next to the pouch. Light it with a match from the box and focus on the light, honoring the Sun King who will shortly make His way into the Underworld. You now notice the first glimmer of dawn on the horizon, above the silhouette of the forest. It is almost morning, and when the Sun King rises, the Goddess will cut him down. He will begin His descent into the Underworld, that the cycle might continue and complete itself. The eternal return, the never-ending wheel. It is time to think of sacrifice, what you are willing and ready to cut from your life, what you need to let go, those things that are stopping you from harvesting your goals, from being productive and happy, those things that you continue to do even though they are a detriment. As you stare into the candle flame, think of what you will sacrifice with the death of the Sun King, the Corn King, that other things may flourish and grow. As the sun rises into the sky, pick up the pencil and paper and write these thoughts down. And when you look into the sky, you see now not just the sun but Lugh the Sun King, and Cerridwen, the terrible and wonderful Sow Goddess. She is keeper of the Grall, the sacred drink of wisdom. She is keeper of the cauldron of rebirth and it is through Her that warriors are reborn. Lugh kneels before Her and, with tears in Her eyes, She raises a sickle and cuts Him down. His blood spills onto the earth in the beams of sunlight, fertilizing and nourishing, preparing the soil for next year’s crop. Cerridwen bows her head and turns away, mourning the dead King. Now take your slip of paper and hold it to the candle where it bursts into flame, and burns brightly as a ray of the Sun King’s blood illuminates it. After your rites, take up the corn and look deep into it, for it is the grain of life. What secret does it tell you? Now, having harvested your crop, having made your sacrifices and looked to the mystery of the corn, open your mead and drink to replenish yourself, and eat your grapes to nourish yourself. When you are finished, gather your tools into your satchel again, and with respect, take your leave of the Sacred Arbor. You quickly find yourself back on the forested path and now you see the early morning birds chirping on their branches. You sense the quickening of air as the Wheel turns and you know you have had a part in it. Continue down the path, back through the woods, back to the edge of the cornfield. There, your friends and family are preparing for the festivities of the day and you feel suddenly invigorated, exhilarated, ready to join in, for the grapes and wine have given you new vigor and all weariness slides from you as you race to greet them. As I count from ten to one, you will return to full consciousness, alert and refreshed. Ten…. nine…. eight…. you will be fully awake and alert…. seven…. six…. five…. you can feel your body waking…. four…. three…. two…. you will be fully alert…. one…. take three deep breaths and when you are ready you may open your eyes. 1) Review what progress you have made duringthe past months. What do you still need to do? How can you alter events so that you harvest fully what you desire? 2) Bake bread, and during every part of the process be aware of the energy of the grain, talk to it, feel the yeast as a living entity. 3) Bake corn bread in a man-shaped pan. Decorate with berries for eyes and ivy vines to represent Lugh, then behead, being fully aware of the sacrifice represented. Give the head to the garden and share the body with your friends as a sign of communion with the God.